Looking for Eaton / Cutler Hammer products? Get a quote fast. Founded in 1911, Eaton has grown to become a global leader in power management and distribution. By acquiring companies like Westinghouse and Cutler Hammer, Eaton was able to grow and expand their product offering to meet the ever evolving demands of residential, commercial and industrial electrical distribution. Founded in 1893 by Harry Henderson Cutler and Edward West Hammer, Cutler Hammer was responsible for several innovations in electrical distribution and protection, like patenting the first automatic motor starter. Cutler Hammer was acquired by Eaton in 1978, and Eaton was able to substantially expand their electrical hardware selection to include switches and disconnects, and other devices in Cutler Hammer’s portfolio. 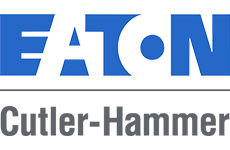 Eaton continues to manufacture Cutler Hammer components under the Eaton brand for a variety of electrical distribution and motor control applications. Whether you need a Cutler Hammer product or an Eaton product, Bay Power carries both new and reconditioned products under both brands. A Cutler Hammer and Eaton busway provides you with a flexible and reliable power distribution solution. Easy to install, adaptable and highly conductive - that’s Eaton busway. For circuit protection in all sectors including residential, commercial and industrial, Eaton circuit breakers come in a variety of current and voltage ratings. Choose from residential circuit breakers, molded case circuit breakers, insulated case circuit breakers, and more. Eaton definite purpose contactors, Eaton vacuum contactors, and Eaton reversing contactors provide your motor with the support it needs. Choose Eaton control panel components for your automation solution. Bay Power’s UL508a-certified panel shop can build you a custom control panel outfitted with top of the line, genuine Eaton control panel components. Eaton unit substations are available to meet a number of voltage conversion requirements across all industries. For top quality protection of all your circuit breakers, panels and other electrical devices, you can count on an Eaton enclosure. Whether indoor or outdoors, metallic or plastic, Eaton carries an extensive variety of protective NEMA enclosures. In conjunction with Cooper and Bussmann, Eaton’s has an extensive offering of fuses across all standard fuse classes. Whether current-limiting or dual element, Eaton has a fuse for every application. Distribute your power throughout your large-scale and small-scale residential buildings with an Eaton load center. Choose from main breaker or main lug load centers. For use in single phase and 3 phase applications, Eaton manual motor starters can be either DIN rail or panel mounted. Eaton MCC buckets are modular components of a motor control center that control a group of circuits. Eaton MCC buckets are available in a number of sizes and designs for effective motor control circuit centralization. Eaton motor control centers provide a centralized, consolidated motor control solution. For use in low voltage systems, Eaton MCC’s help you to better operate and control industrial machinery. Eaton motor starters keep your motors safe and under control. Monitor phasing, voltages and more while protecting against equipment failure with an Eaton motor starter. Eaton carries both thermal overload relays and electronic relays to meet a vast range of requirements and applications. Choose Eaton for flexible mounting options and top of the line motor protection. Eaton is an industry leader in panelboard technology. Whether you need a lighting panelboard or a power distribution panelboard, you can count on Eaton for a compact, innovative panelboard. From 22mm push button switches to 30mm push button switches, Eaton carries a variety of push buttons in most standard sizes. Choose from emergency push buttons to heavy duty push buttons and more. Keep your three phase motors safe and controlled with an Eaton soft starter. Easy to install and easy to maintain, there’s an Eaton soft starter solution for every motor application. Eaton’s lineup of Pow R Line C switchboards is recognized industry-wide for its reliability and its convenient modular configurations. For safe power distribution, trust Eaton. Choose an Eaton automatic transfer switch or an Eaton manual transfer switch for safe, reliable switching and circuit disconnection. Eaton carries both low voltage switchgear and medium voltage switchgear for reliable circuit control and protection across industrial and commercial applications. Eaton carries metal clad switchgear and arc resistant switchgear. Eaton’s portfolio of dry type transformers combine performance and sustainability. They are fit for commercial, industrial and residential applications. Eaton VFD’s and Eaton medium voltage drives protect and control your motor, while saving you on energy and extending your motor’s lifespan. Have any old or unused Eaton / Cutler Hammer products lying around? Don’t get rid of them just yet. While we stock a wide range of quality electrical products and solutions, both new and reconditioned, we also buy back your unwanted equipment. So, before deciding what to do with your old Eaton / Cutler Hammer products and components, have one of our expert technicians take a look to see if we can save a few parts, save the environment, and save you some cash. Great service shouldn’t end after the purchase. We pride ourselves on the relationships we build with our customer-first mentality and the quality of our Eaton / Cutler Hammer products and components. That’s why we offer a 1-year replacement warranty on all of our electrical products and solutions from the top manufacturers. Because when you buy with Bay Power, you buy with confidence. We are proud to stock a variety of competitively priced, new and reconditioned components from the leading manufacturers of Eaton / Cutler Hammer products. Thanks to our extensive inventory of Eaton / Cutler Hammer products and components, our resourceful and expertly trained staff will always be able to get the products that you need. Through our extensive network of suppliers, we are able to carry and acquire a huge variety of electrical products and solutions, so chances are if you need it, we can get it. Bay Power’s priority is providing you with reliable, high quality electrical hardware. That’s why our mission is to make sure our reconditioned electrical products and solutions function as perfectly as the day they were built. Because while the quality is high, the cost of Eaton / Cutler Hammer products shouldn’t be. Our selection of new surplus Eaton / Cutler Hammer products may not arrive brand new in a box, but they function just as well, and have never had electricity run through them. All of the quality, none of the packaging, always with our 1-year replacement warranty.